Avid football fans, Janelle and Carlos met at a friend’s house watching a playoff game for the Superbowl. Despite loving different teams, they manage to enjoy the game together each season. The evening Carlos proposed, he took Janelle to her favorite restaurant and then up to the Roanoke Star. He had already secretly met with her parents to ask for their blessing, and he had arranged for their friends to hide out in the trees. When Janelle turned around, his son was holding a small box. Janelle cried while Carlos explained the special symbolism behind the custom amethyst and black diamond ring he had designed for her. The ceremony was written by the bride, groom, and the couple who performed the ceremony. They weaved together light hearted love, meaningful words of light, biblical messages of love and covenant, and precious tidbits from parents and role models to speak of the life they wanted to have together. Janelle and Carlos had a Batman theme for their wedding. Everything from the music to the lighting and decorations was focused around the epic theme. Their venue, the Grandin Theatre, provided the perfect atmosphere to tie everything together. They even served popcorn after the ceremony! To go along with their theme, they incorporated a blend of light and dark grays and purples, and as much silvery sparkle as possible. Instead of flowers, each guest table had a different character theme like The Riddler, The Penguin, Catwoman and Poison Ivy, with tablecloths and colors to match. Each table also had fiber optic lamps with a lighted vase of that table’s character. Their cake topper was custom made with their names and color scheme in a bat signal and a Gotham City skyline. Both the dinner buffet and the dessert buffet was provided by friends and family bringing special dishes, blending Italian, Mexican, and American cuisine. They also set out a dessert platter of Little Debbie Fudge Rounds and York peppermint patties-Janelle’s favorite treats. The wine that they served was hand picked by Janelle, Carlos, and Carlos’s brother from Janelle’s hometown. Janelle took pieces of her mother’s wedding dress when creating her three-layer veil, and she also used part of the sleeve to wrap around her bouquet. 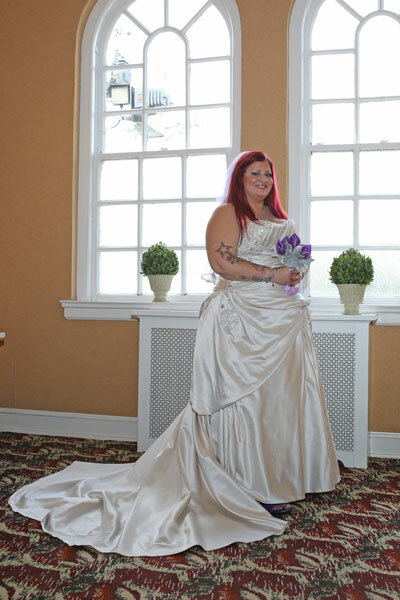 Her shoes and the maid and matron of honor’s headbands also received special attention from Janelle, and each were embellished with sequins and rhinestone stars. She also incorporated stars into her wedding dress, appliqueing the side and hip of the dress. Both her bouquet and her bridesmaids’ bouquets were also handmade. The last big project for Janelle was Carlos’s tux. They wanted something that screamed “The Joker” without being too costume-y. 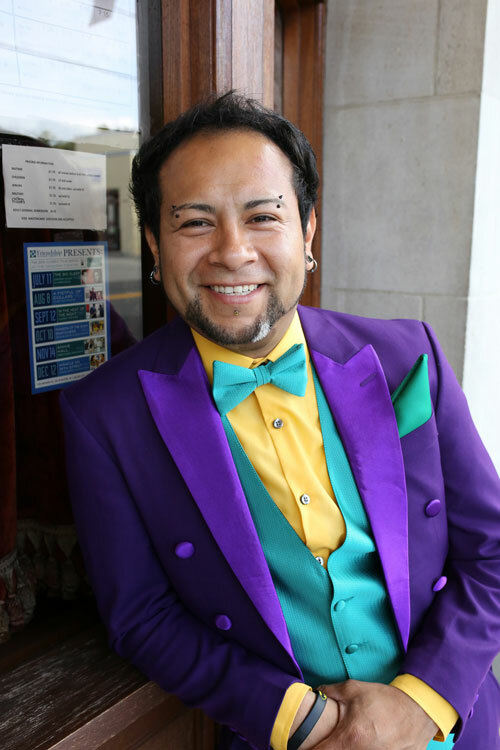 She designed the purple tux, and they found the shirt and shoes to match. They also custom made the groomsmen’s t-shirts. The suspenders and matching purple shoes really tied the look together. It was also really important for Janelle that every member of the wedding party had some Batman charm linking them together. She made necklaces for the groomsmen and wore a bracelet herself, and they also had matching silver sunglasses with the bat signal on the lenses. There were a lot of details that pulled this wedding together, but all their hard work paid off and created a truly unique wedding experience! Make sure to see more of the Roman Wedding on page 86 of bridebook!